Finally, a speargun bag made of 100% waterproof material that rolls up (super compact) when not in use! Salt water, Sand, Rain, Dirt, Mud, Fish Guts…No Problem! Boat, Beach, Pickup Truck…No Problem! Holds fish and ice…No Problem!! Rolls up (compact) when not in use… Stores in your dive bag. This is a “DIVE LOCAL” speargun bag. 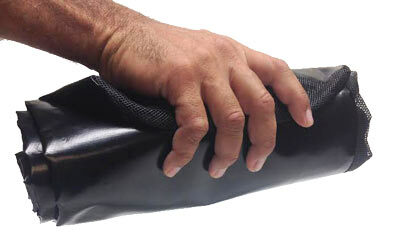 No bulky padding so you can roll it up and store it in your dive bag when not in use. 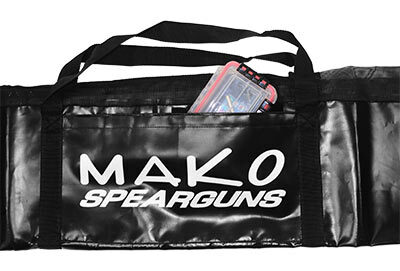 For Air travel, we recommend the MAKO Spearguns Heavy Duty Padded Speargun Bag or the Sport Tube. Will not rot or fade like cloth speargun bags. Vented mesh top allows for drying of spearguns and maximizes air flow. Durable zipper provides easy access. Handy side pocket with Velcro closure. Perfect for boat or beach trips. NOTE: As with all speargun bags, it is necessary to use “Spear Tip Protectors” (one on each end of spear) to prevent spears from puncturing the bag. NOTE: When selecting your bag size, remember that spears are always 40 cm longer than barrels and that spearguns are measured by the length of the barrel. If you would like to carry your speargun with the shaft engaged, you will need to add 18cm(7 inches) for the Iconic ETR and 13cm(5 inches) for the Predator Pro to cover the additional length of the handle. For example, a 110cm Predator Pro will be 163cm with the shaft engaged, which would still fit in the medium bag. You will need to size up to the large bag if you wanted to carry a 120cm Predator Pro with the shaft engaged. Great gear at a good price. Customer service, as always is tops. After some experience losing spears, mixing up my equipment with someone else, having guns scratched, and looking all over the place for my stuff aboard a boat with a bunch of other spearos, I decided to buy the bag. Especially useful aboard a boat so you can keep your gear in one place and easy to track. It's very light and small so you can pack it away in your suitcase without worrying that it'll take up space or weight in your luggage. Then, you take your guns and stuff out of the sports tube and use the gun bag. Just make sure to measure your guns and get the right size.